Arguments With The Lake. Tanis Rideout. Wolsak & Wynn. Hamilton, Ontario. 2013. Tanis Rideout's Arguments With The Lake is a fictional account of the lives of Marilyn Bell and Shirley Campbell, two long distance swimmers who tried to swim Lake Ontario in the 1950's. Campbell was unsuccessful and Bell became a legendary figure. Arguments With The Lake imagines their relationships, the relationship we all have water and the tides that push us together, pull us apart. the cormorant with dried wings. Sixty-four against the current. bumbling against your window. This might be finished tomorrow. She inhales, wishes for the bones of a bird, a pigeon's honing for home. Small arms become wings, beating against the jagged lake. She'll make the decision over and over and over. Nothing is a miracle or happens only once. As much as these poems, as a collection, tell Marilyn Bells' story – emotionally, these poems are telling universal stories, ones that we can all identify with. I have to believe Rideout is some sort of swimmer herself, has a great deal of experience being in the water, at least that's what her poems tell me. I know two serious swimmers who are also writers. Richard Taylor, whom I had the pleasure of studying under at Carleton University, has written at length about swimming and his relationship to the water, the contemplative universe it creates. Another friend, Toronto poet Ward Maxwell, also swims for distance. Rideout has captured the feel of that world and shares it until your fingers begin to prune a bit. chest. Arms churn, pray they won't tire. Six hours to daylight. when her foot slips from mattress in nightmare throes. from the ribs down, as though amputated, erased in ink. froth, delineating her from the dark. Breathe. Tanis Rideout doesn't make this movie into a Hollywood fairy tale – it's more of a tug of war against the pull of tides and reason. Rideout's crisp voice resonates throughout this saga whether from behind the winsome eyes of Bell or those of the tragic Campbell. each instrument's a question. You're being distilled. How long before the water gets into every part of you? the tongue, across the gums that holds a hangover. the same as you were before. and turn, the lake still sloshes against your skin. Rideout gives us a history lesson, a swimming lesson, and a treatise on the nature of the long distance swimmer – but she is really talking about the navigation we must all endure, pulled as we are towards the rocks of shore. of Belleville, Napanee, Kingston. Lake becomes a river. for two-car couples arriving by the highway. remembrance: chipped, faded, broken down. that shriek and warn with red dots on their beaks. I am their home. below lumbering cargo ships on the Saint Lawrence. Tanis Rideout's Arguments With The Lake is accomplished stuff, compelling, well crafted and clever. These comments appear on the back cover of Tanis Rideout's Arguments With The Lake, I think all three of them eloquently say what I was attempting while thrashing about in deep water. "Cold-eyed and driven, these poems carve away the fatty sentiments around the Great Lake swimmers, those glamour girls of myth. With these constantly surprising and multifarious narratives starring Marilyn Bell and Shirley Campbell, two girls swallowing the 'frigid knife of water," Tanis Rideout proves herself capable of just about anything." "Poems that swim elegantly, that slide streamlined with every other flowing thing - as if they themselves were another layer of fluid." 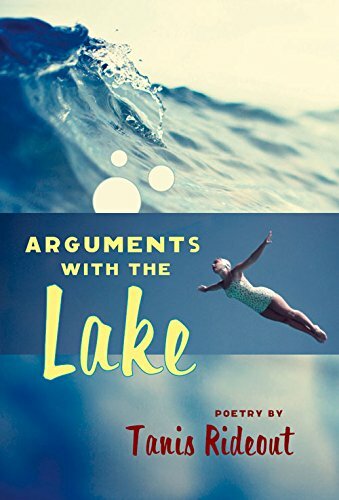 "Arguments with the Lake is a coming-of-age poetic odyssey told in mythic and sensuous language. In these verses the poet engages the element of water to discover the many meanings of (her) life. MacEwanesque in scope, Arguments with the Lake invokes in the reader a sense of timelessness and breathless wonder."